Gutters and downspouts serve the important function of moving water runoff away from homes. If you don’t have both of these installed on your Henderson, Kentucky, area residence, there’s a much greater likelihood that your walls and foundation will sustain water damage. Water runoff can also cause soil erosion and expose your home’s foundation, putting it at risk of damage. At 31-W Insulation, we can provide you with durable aluminum gutters manufactured by the industry leader Spectra Metals, and they will reliably carry water away from your home year after year, helping keep it safe. The benefit of having seamless gutters isn’t just aesthetic, however. It’s also functional. Once they’re installed by our factory-trained professionals, there’s virtually no risk of them coming apart or sagging. The same can’t be said for sectional gutters. Since leaves and other debris won’t have an opportunity to snag on any seams, cleaning and maintenance will be easier. What’s more, not only will our seamless gutters make your home safer, but they’re also a safe home investment thanks to their 20-year limited manufacturer’s warranty. 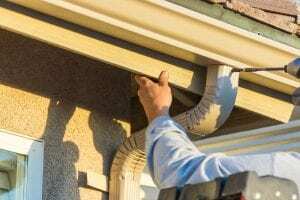 Don’t wait any longer to get gutters and downspouts for your home or to replace your old ones. Contact 31-W Insulation today to schedule a free consultation at your home in the Henderson, KY, area and learn more about how our seamless gutters can help protect your residence from water damage.